I have more free printables coming at you today! I hope you are ready to get organized for 2016 because I am. Today is all about meal planning and the tools to stay on track with your grocery lists and budget. Meal planning will save you both time and money. You’ll always know what you are making for dinner ahead of time. No more standing in front of the fridge staring at food, but NO idea what to make with it. Plus, you won’t waste groceries. I used to buy produce at the grocery store and then forget it at the back of the fridge. I wasted $$$ and had to throw out a smelly rotten piece of fruit or veggie. Not fun. When you shop for groceries, you’ll do it with a purpose and an actionable plan. This 2016 Meal Planner includes a monthly meal plan calendar, a weekly meal planner and grocery inventory. If you don’t plan your meals yet, start in 2016. The Internet has a ton of info either through Google or Pinterest. If you prefer to read a book, I’ve got a list of books to read to learn more about meal planning. The printable is in pdf format. Save this post and then you can come back and reprint more whenever you like. Feel free to share the post with your friends and family so they can use them too! 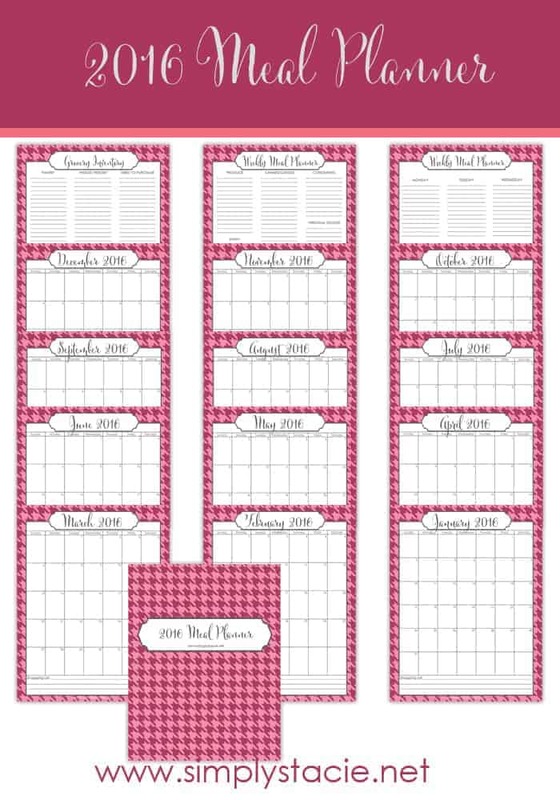 Check out my other free printables: 2016 Financial Planning Printables, Recipe Card Printable, Password Organizer Printable, Weekly Menu Planner, Important Phone Numbers Printable, Grocery Shopping List Printable and Daily Cleaning Checklist. If meal planning isn’t your thing, that’s ok. I’ve got more printables coming up this month so keep your eyes open! Ooh – very handy – have bookmarked you so I can have a good look through your printables… this one and the financial planner look like things I really need to help me with my New Year resolutions 🙂 thank you! Awesome! Thank you! My one resolution was to get back to menu planning; it worked so much better when we did! These are so pretty – thanks for making such a useful printable! Have an awesome January! Oh man, these are perfect! Thank you so much for sharing them at the #SmallVictoriesSundayLinkup!